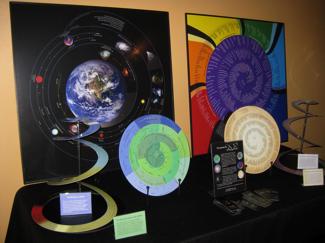 Timespirals identify events given to us by science about Earth’s evolving creation story, and show how we humans fit into 13.8 billion years of cosmic, geologic, biologic and historic evolution. Thus the spirals provide a broad context and grounding for further explorations in astronomy, earth sciences, biology, history, ancestry. 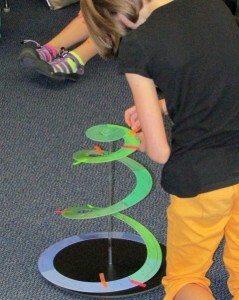 Seeing Time portrayed as a spiral will reinforce your sense of Belonging. The present moment is shown as the center of each spiral, thus acknowledging each of us as a unique expression in an unfolding universe. 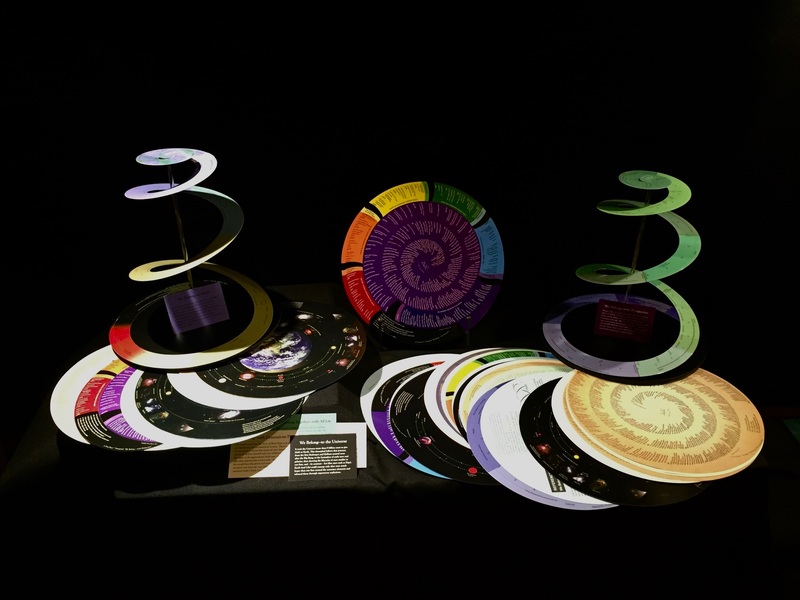 Each set of timespirals includes all 6 views of time, and makes use of color, text and graphics. Tracking 9 billion years of galaxy and star evolution including lifecycles of different sizes of stars, leading to the emergence of Earth some 4.5 Billion years ago, and using the visual of Earth as it appears today. Showing colors of the planet’s surface as if photos had been shot from space every 100 million years to the present, and presenting the major cosmic, geologic, atmospheric and biologic events and processes that have occurred. Chronicles the story of plate tectonics, major geologic events and emerging life. It also identifies “common ancestors” where human lineage coincides with the lineage of other present-day life forms. Using the powers of 10 (thereby summarizing events for the past 5,000- 50,000- 500,000 – 5 million – 50 million – 500 million and 5 billion years) — this spiral graphically illustrates that human civilization covers only 1 millionth the span of Earth’s story. The world has changed in astounding ways over the past 360 years. 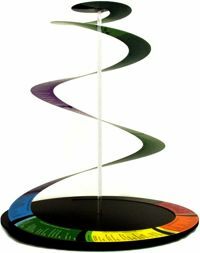 This timespiral tracks major events using 4 different themes, and invites personalizing the spiral to reflect ancestors and/or location-specific history. A dual-purpose timespiral for both ancestry and for envisioning the future. Our visions of the future – whether positive or negative– affect our actions today. And today’s actions will determine the quality of life for future generations. a 2 dimensional form, especially suited for teaching, referencing, transporting, as well as displaying. come with 4 reference sheets which are printed on both sides, offering detail, depth, and ideas for use. FREE SHIPPING in United States FOR INTERNET ORDERS OVER $200. Perfect for personal and classroom use where budget is a key consideration. Ordering several Basic Sets — together with the 2-D Display Set, (see below) will provide an option for storing all the materials together while making them easily accessible. 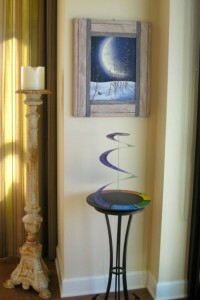 Identical to the Basic Set, above, except that it adds a 13.5 inch metal easel that is heavy duty and high quality. This set provides a beautiful and inexpensive display, and the easel is extremely practical as a storage unit for up to 4 of the 2-D Basic Sets. This set allows you to display all 6 versions of the We Belong series at one time, mounted on 6 metal easels with display cards identifying each spiral. 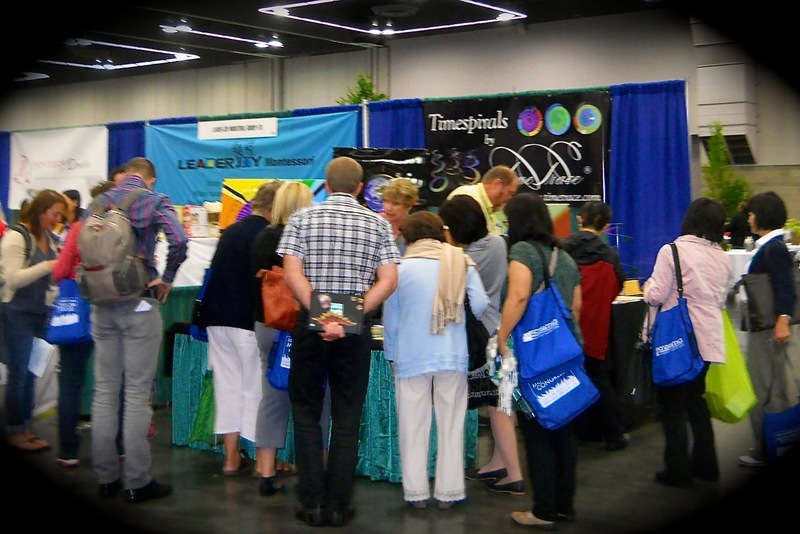 Perfect for classroom or conference set-up where you want people to see all the perspectives of time without needing to turn over any of the materials. 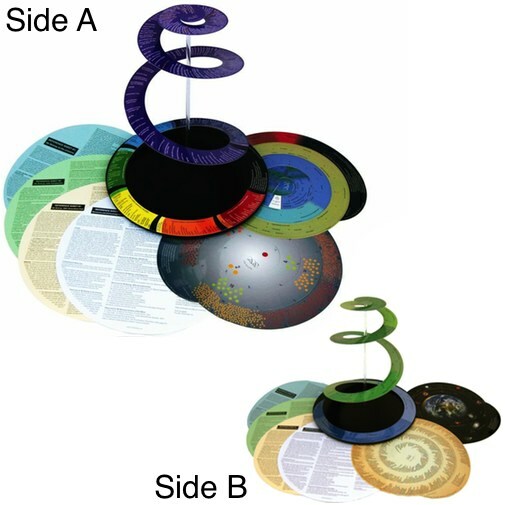 This set allows you to display one 3-D spiral at a time, mounted on a turntable. 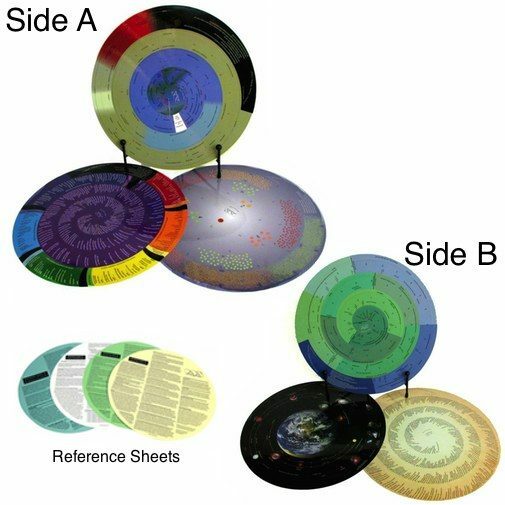 6 full sets of spiral timelines! Perfect for classrooms to share and for the whole school to enjoy! Posters of the We Belong series are now available to order. Posters are available through Zazzle.com. 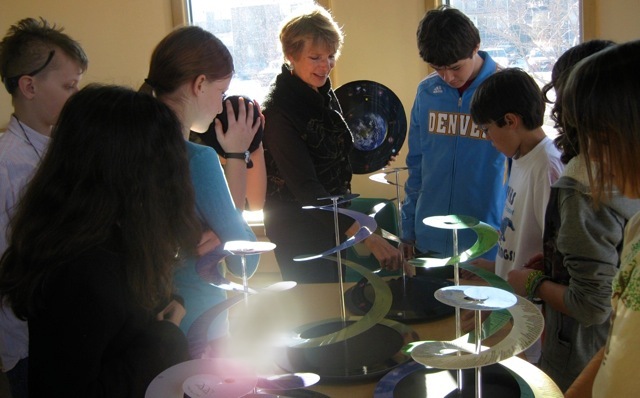 Teachers and other customers have requested a larger format to display while 2-D and 3-D timespiral sets are also present in the room for hands-on study and interaction. 2 sizes — 32×32 or 40×40. The smaller version is adequate for most displays. See photo, left. Posters are sold individually; not as a set. No reference material comes with them. Posters can supplement but not replace the timespiral sets. 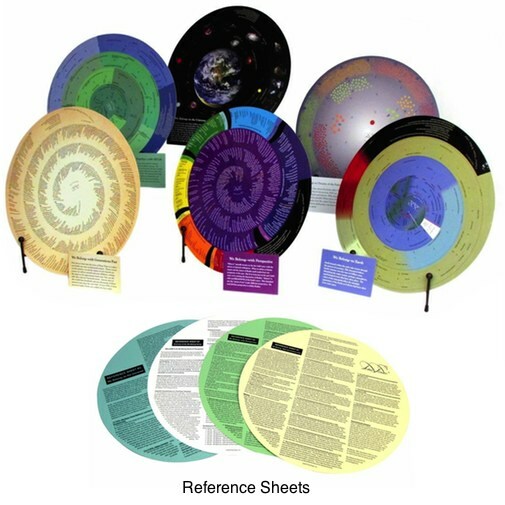 Only the sets, sold on this website, contain all 6 versions of the timespirals as well as the reference material. Posters start at around $35 each and customers will want to get them laminated. Zazzle doesn’t yet offer lamination as an option, so it will be up to the customer to find a lamination service. Zazzle gives a 100% satisfaction guarantee. “If you don’t absolutely love it, we’ll take it back!” is their motto. 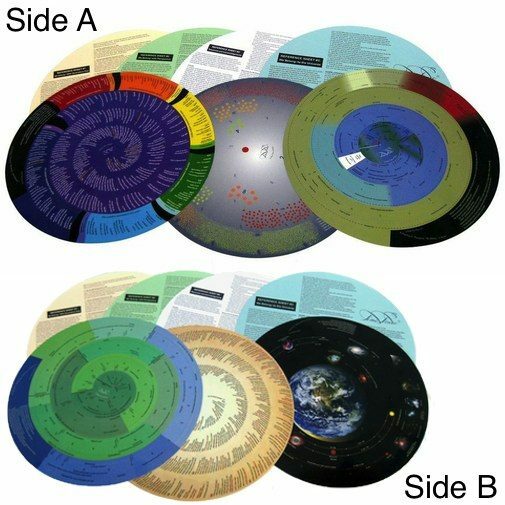 If you are dissatisfied with any timespiral set sold by TimeTrace® through this website, please return it for exchange or refund within 30 days of receiving the order. For more information concerning our guarantee, contact us. Any questions about ordering? Contact us and we’ll get back with you shortly. TimeTrace © 2019. All Rights Reserved.